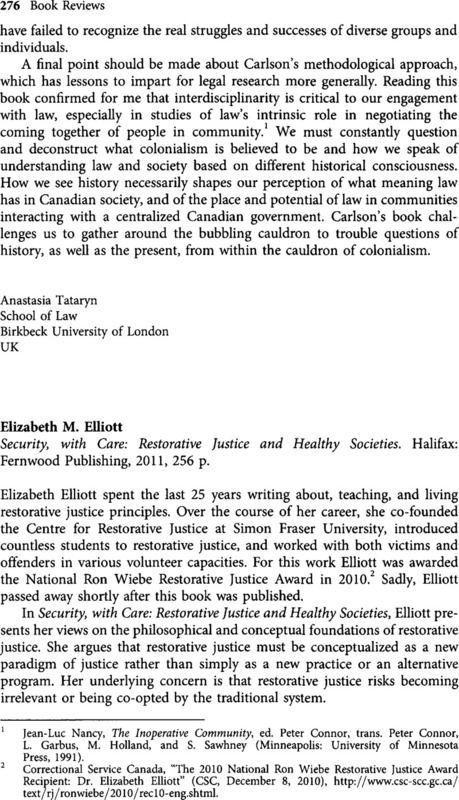 Elizabeth M. Elliott, Security, with Care: Restorative Justice and Healthy Societies. Halifax: Fernwood Publishing, 2011, 256 p.
2 Correctional Service Canada, “The 2010 National Ron Wiebe Restorative Justice Award Recipient: Dr. Elizabeth Elliott” (CSC, December 8, 2010), http://www.csc-scc.gc.ca/text/rj/ronwiebe/2010/reclO-eng.shtml. 3 Coben, James and Harley, Penelope, “Intentional Conversations about Restorative Justice, Mediation and the Practice of Law,” Hamline Journal of Public Law and Policy 25, 2 (2004): 235–334, 268.